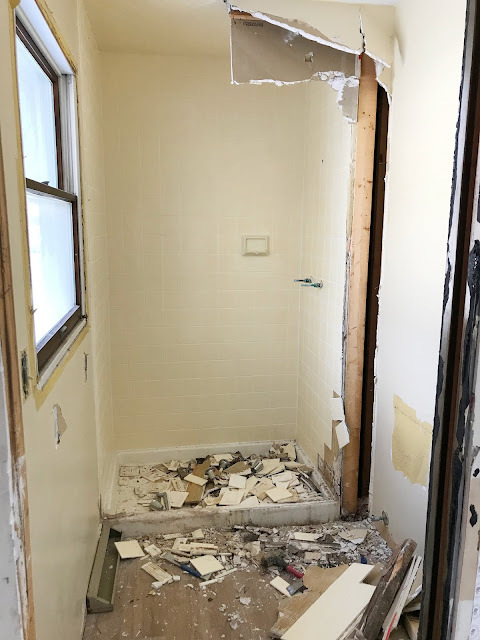 Since our kitchen is at the state of completion, I wanted to throw a party. That's a little weird for me, since Mike's always the one to suggest dinners and having groups of people over. I think I've always felt our awkward little kitchen was not only ugly, but not conducive for entertaining. Now that we have our dream kitchen, for this house at least, I was excited to have people over! The only problem was, I couldn't think of an excuse. I was itching for a real party, paper invites and all. 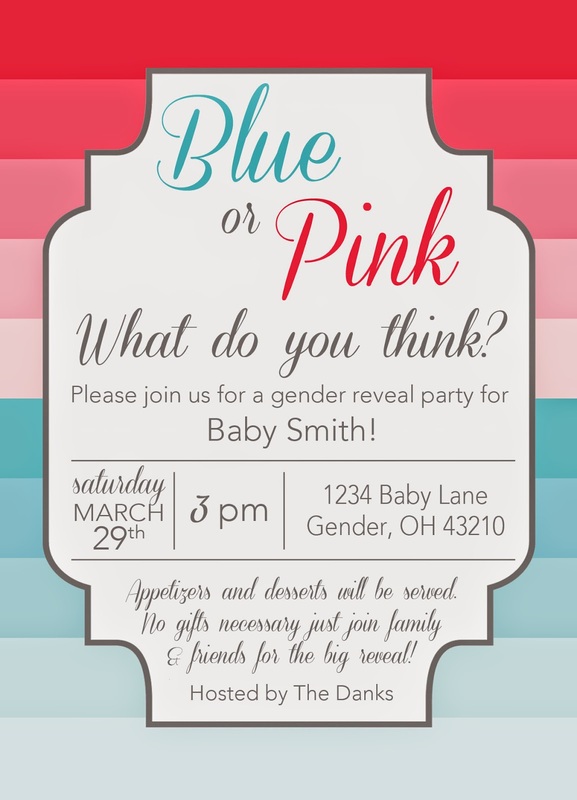 It just so happened that our very close friends were finding out the gender of their second child around the time I was hoping to have a party, and since there wouldn't be a baby shower, a gender reveal party it was! It actually was really easy to throw together, so much so that I didn't freak out when I realized we would be in Canada for a long weekend the week before. I found my inspiration in the form of this invite from Etsy. 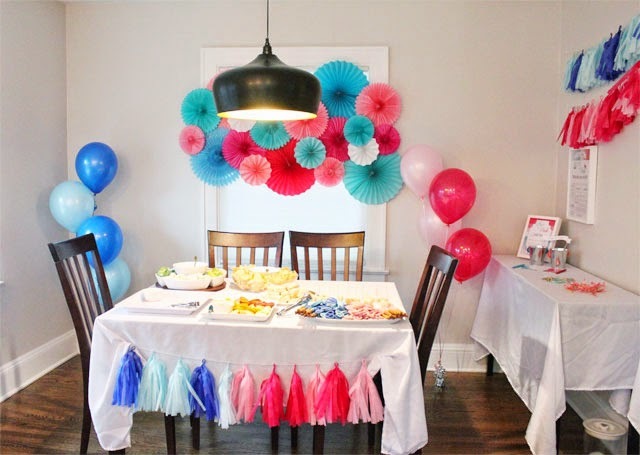 I kept the ombre color theme throughout my decorations. My friend's husband thought I was crazy for actually using decorations, but it made the party in my opinion. Ps. How does one run around like crazy getting a party ready, and have time to take super styled photos? I didn't even have half the food out in the photo above and took this photo about 7 minutes before everyone showed up. The background, (which unfortunately had to share the spotlight with our new dining room pendant light - which I'll share more details later), was a bunch of paper fans I bought and hotglued to 2 pieces of poster board taped together. I first laid everything out on the floor, then starting gluing. Don't forget to take a photo to look back on when gluing in case your cat decides to jump over and knock some fans off. Just saying. I trimmed the pieces of poster board that you can see in the edges and along the sides. 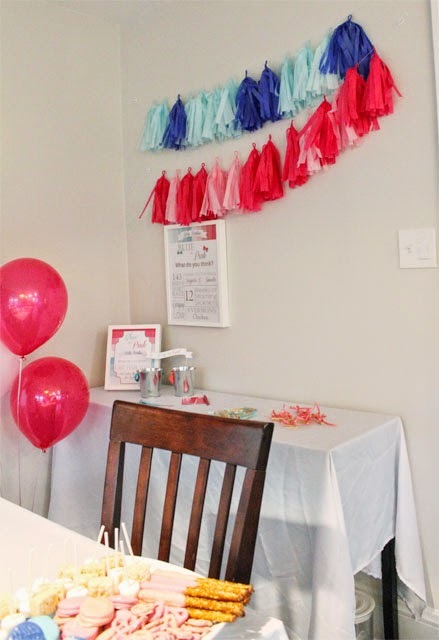 I also made the tissue paper tassel garland, probably my favorite decorating item, that I mastered back at my bridal shower. They even made an appearance at the wedding. The dining room was the perfect place to decorate since it's still such a blank slate. We have curtains to hang, but decided to hold off until after the party so it would be easier to decorate and hang things up. The small table on the right used to sit in the living room, but has been displaced since we installed the fauzdenza and was used for a little guessing game. I made a sign with a couple pregnancy facts for anyone that wanted to use the old wive's tales for their guesses. I used a command strip, (my absolute favorite hanging system), to hang it above the table. Everyone made their guess then wrote their name on a piece of paper, then placed it in the color coded bucket. They also grabbed a little clothes pin with a blue or pink ribbon in it to wear. After the reveal, we picked a name from the correct gender bucket and they got a gift card. Really simple, but kept people involved in the fun. Since the party started at 3pm, I had some heavy apps, including these buffalo chicken empanadas, (so good), smoked chicken spinach artichoke dip, (mike took lead on this since it's his fav), and some tomato and bacon cups, (my mom's recipe - cooked in biscuit "cups"). Also, some veggies, fruits, and chips and dip. For dessert I made rice krispie treats, then dipped various items in chocolate, because anything tastes better dipped in chocolate. It was also a way to carry the ombre color design into the food. Pretzels, oreos, and marshmallows, oh my! 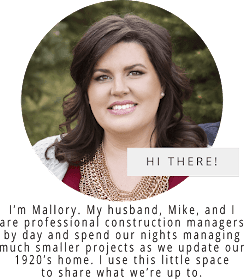 Everything turned out great, and it was so much fun showing off our new kitchen and getting to share in our friend's big reveal. Oh, and for "main event" I made our godson a shirt to announce the new arrival. He had the shirt under his regular shirt, then lifted it up for everyone to see! It was so much fun to see everyone who had guessed a girl! I'll have to remember that for next time. And, thank goodness for the kids section of Netflix because even though they could have jumped on the couch all night, it was for the adults sanity that all the kids crashed in front of the tv for a little bit to calm down!